"I’d never thought about it, the end of the world. Nor had I imagined that I’d have to face it in my own lifetime. This past year I’ve been so busy trying to get through each day without thinking about what happened last October. But the universe doesn’t care about our little problems. It has its own way of deciding things—and I’ve come to understand that the universe is a much stranger place than I’d ever realized before." Jenny Baker thought that life was all mapped out for her. A junior in college, she studies physics and lives at home in the college town of Long Lake, West Virginia. She and her boyfriend, Jake, have been together since they were both freshmen in high school—everyone assumes that they will get married when they graduate. On October 1, 2020, her life is shattered. Tragedy strikes and, depressed, Jenny drops out of school to take an internship at the university’s observatory, located in the Appalachian Mountains. There, she discovers a comet, destined to end all life on Earth. “I AM” follows her struggle for a sense of normalcy, and takes her on a journey of self discovery. On October 1, 2020, Jenny's life is shattered. Tragedy strikes and, depressed, Jenny drops out of school to take an internship at the university’s observatory, located in the Appalachian Mountains. There, she discovers a comet, destined to end all life on Earth. “I AM” follows her struggle for a sense of normalcy, and takes her on a journey of self discovery. 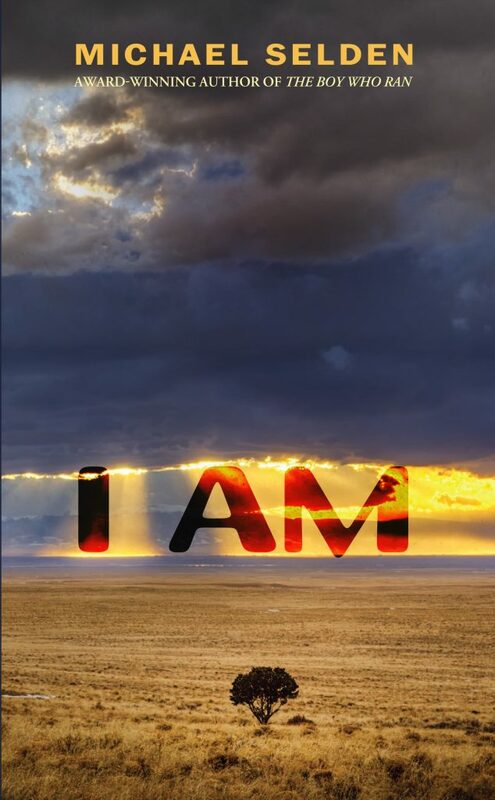 "I AM" is a Science Fiction novel, written for a New Adult Audience. It spans about one year of time and takes place just a few years from now. The Comet, "Dark Traveler" has an unusually low albedo—it's very dark, almost invisible, and has been following a hyperbolic orbit from the Oort cloud. The Oort cloud is a massive collection of debris that orbits the sun. The NASA web site has a nice description of the Oort cloud. Wikipedia also has a nice description. A note on technical content: This is a realistic Science fiction story, which means it has a lot of hard science packed into it as well. In fact, one astronomer said it brought him back to the days when he was at the university, studying to be an astronomer. The author was a research physicist for almost 30 years and spent time at observatories, testing technology developed to help extend our understanding of science. The Matera Laser Ranging Observatory, located at the Italian Space Agency’s ‘Centro di Geodesia Spaziale G. Colombo’ (CGS) near Matera, a small town in the South of Italy. The comet has been placed in an accurate theoretical orbit, it's angle with respect to the eclectic (the plane of Earth's orbit around the sun) and with a set date and time of closest approach to the sun. I use a hyperbolic orbit (eccentricity >1). The book tracks the apparent position as Jenny moved through the months of the book. As the the book progresses from chapter to chapter, dates and the current position of the comet (in Right Ascension, Declination) is shown. These use the Jan 1 2000 epoch coordinates—RA, Dec can vary as time goes by, because the direction the axis of the earth varies along a circle with a period of about 26000 years. The star that is closely aligned with the axis changes over time, too, but slowly. 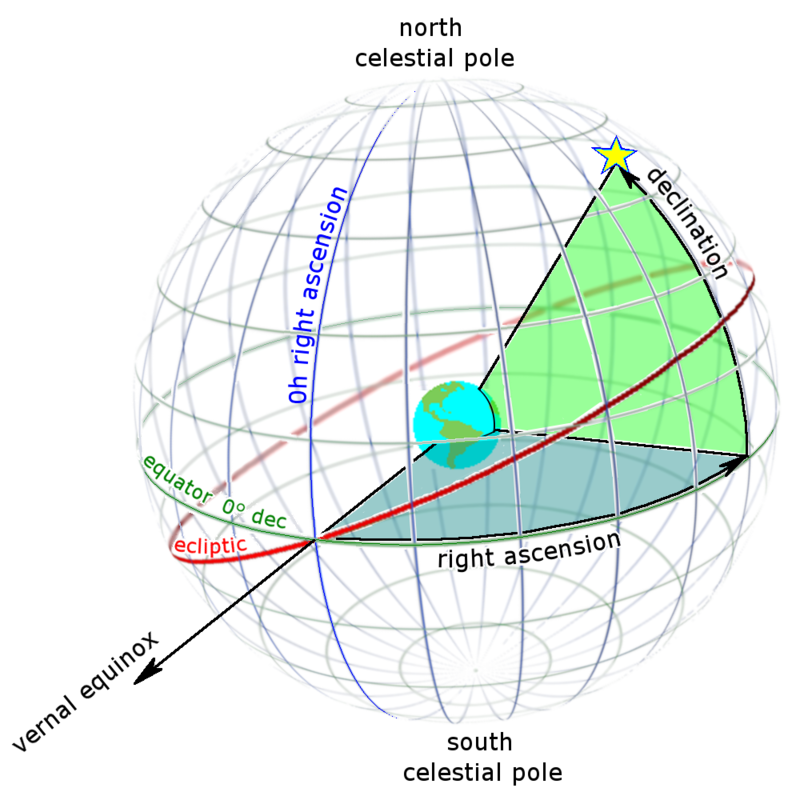 The diagram below (From Wikipedia) shows the RA, Dec coordinate system, which is based on a reference when the sun crosses the equator at the vernal (March) equinox. At this time, as the sun seems to cross the equator, a point of 0 hours, 0 minutes, and 0 seconds is set. To view any object in the sky, you need to understand how far away it is around the Earth from this zero point. The 360 degrees in angle are converted into 24 hours of time, so that you can use a clock to understand where to point. As the year progresses, the sun's declination changes with the season from between -23.5 degrees (Winter Solstice) to +23.5 degrees (Summer Solstice). In a similar way, the axial tilt of the earth shows up as a changing declination angle throughout the year, and the position varies by season and as the wobble angle of the earth's axis changes a little on it's almost 26000 year cycle. RA / Dec is used at observatories to understand where an object is in the celestial sphere and then this is transformed into an azimuth and elevation angle for each telescope, based on their location on Earth and on the orientation of the telescope itself. All Copyrights Reserved 2013-2019 Michael Selden. All Rights Reserved.